I have a confession... I am addicted to laminating things, and not with the thin, cheap lamination you find at most school supply stores, the thick, wonderful, never-going-to-peel lamination from places like Staples and Office Depot. I like it, because it is so thick and doesn't bend. I know I can give it to my students and it will last for many years (hopefully!). So today, I decided to laminate some items with this amazing lamination, including my Check for Understanding bookmarks, my Voice Levels Posters, and my Classroom Expectations. I also plan to laminate some book luggage tags I created today that you can see here. This year I have decided to spend some extra money and laminate these tags with thick lamination and put clear mailing labels with the students' names on them. This will allow me to reuse the tags for multiple years, which I think I will like. I just tried printing one of these tags, and they're a little large... I'm going to work on that and upload some new ones when I get them fixed. They are perfectly fine the way they are, but they are a little large for what I plan to use them for. I also got in contact with Michelle from The 3a.m. Teacher to help me with some freebie frames she had posted. I want to give her the BIGGEST shout out, because she was SO helpful! I saw this freebie frame, and wanted to modify it a little (by filling in the middle with a solid color). She was so quick and had my requested color, plus many more colors and FONTS done for me within an hour. This girl is AMAZING! What do you think of them? I had originally planned on using a solid background, but thought that looked a little boring. I may end up making one bucket of each and then deciding! 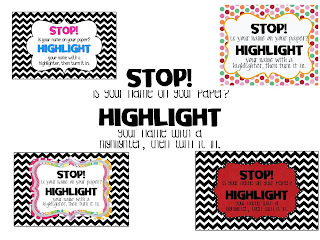 Also, in my frame madness today I created some labels for the oh-so-cute "Highlight Your Name" buckets I see everywhere. You can get those by clicking the picture below. Let me know what you think! And be sure to check out both my TN and TPT shop as I have added several more items! I Just found your blog today and I'm loving it! I am SO excited to have you as a follower! I love your buckets!! I have nominated you for an award. Stop by my blog to pick it up. Thank you for the love!! You are soo sweet!! Thank you! I have so much fun reading your blog and you are such a big help! Your buckets are adorable!!! Thanks for joinig my Newbie Blog Hop! I love connecting with more third grade teachers. PS I love your classroom!! Thank you so much!! I am very excited to use them! I am so happy to have another third grade teacher to connect with!